People used to be able to walk into the White House. Legally. Getting onto the White House grounds is not easy, even when you have an appointment to be there. It is likely to get even more difficult as the U.S. Secret Service weighs options to keep tourists and others farther away from the executive mansion in the wake of an unprecedented security breach Friday where a man jumped a fence surrounding the complex and entered the White House, where he was arrested. But once upon a time it was possible for just about anyone to stroll into the president's home during an open house and partake in the free-flowing booze. Like that time people nibbled on a 1,400 pound block of cheese and ground the crumbs into the upholstery. Seriously. The White House opened in 1800. John Adams was the first president to live inside the mansion. But it was Thomas Jefferson who saw the White House as the "people's house" and opened it to the public. He built a stone wall around part of the mansion's perimeter, but it was to corral livestock that grazed on the lawn, not people. For decades, people were allowed to stroll the White House grounds during the day and enter the mansion. Jefferson, who was instrumental in ensuring the White House was a house for and of the people, not a grand mansion, started the practice. He put taxidermied bears on the lawn and displayed artifacts from the Lewis and Clark exhibition, said William Bushong, Chief Historian for the White House Historical Association. "In the time of Jefferson you could go walking up, look at the artifacts from the Lewis and Clark exhibition," Bushong said. Jefferson and subsequent presidents, along with their wives, would greet visitors in the East Room around lunchtime. People were not allowed in during the morning, when the president was sleeping, or while he was out of town. People were, however, allowed to have essentially unfettered access to the White House grounds. 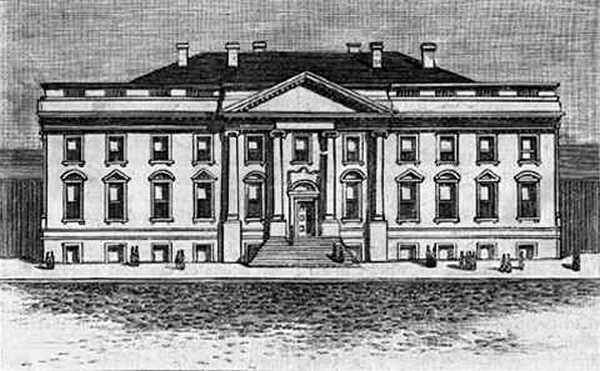 British troops burned the White House in 1814. When James Monroe moved back into the renovated structure he added a large iron gate to the perimeter of the grounds, much like the one that stands today. According to a 1995 report issued after security breaches at the White House, the fence was built so people could see the White House; Jefferson's wall impeded some of the view. "Monroe's democratic impulses did not, however, prevent him from installing gates equipped with heavy locks," the report read. Jefferson also started the practice of inviting people back to the White House for a post-inauguration open house. Things got a bit out of control in 1829, when thousands of people descended on the mansion after Andrew Jackson was sworn into office. People swarmed into the mansion and crushes of people attempted to greet Jackson, many standing on furniture to catch a glimpse. At the end of his presidency, Jackson opened up the White House to the public so they could help him eat a 1,400 pound block of cheese he was given as a gift years earlier. Pieces of cheese fell on the White House carpet and guests ground them into the upholstery with their shoes. The White House smelled like cheese for the next year, Bushong said. James Fenimore Cooper wrote about a man who visited the White House during the presidency of James Monroe. “I have known a cartman leave his horse in the street and go into a reception room to shake hands with the President," he wrote. Despite being open to the public, there was very little security at the White House until a drunk man threw rocks at President John Tyler. Shaken up, Tyler created an "auxilary guard" that was assigned to protect the White House. Franklin Pierce, who once had a hard-boiled egg thrown at him, was the first president to demand a full-time bodyguard. Abraham Lincoln had a phalanx of bodyguards and stationed guards at the White House. After the Civil War, however, security measures dropped off. The White House gates were open each day until the mid-1890s. Grover Cleveland's nanny used to take his daughter, Ruth, out on the South Lawn, where members of the public would fuss over her. Cleveland's wife didn't like this and ordered the gates to be locked, Bushong said. The Secret Service was founded in the 1860s as part of the Department of Treasury to investigate financial crimes, but started taking on a protective role soon after. According to the 1995 report, Frances Folsom Cleveland learned of a plot to kidnap her children while the family vacationed in Massachusetts and persuaded Secret Service agents to guard the home. The Secret Service assumed responsibility for protecting the president after the assassination of William McKinley in 1901. Cleveland also instituted a force of 27 Washington police officers to protect the White House perimeter. During World Wars I and II the duty was left to the military. In 1930, the protection of both the president and White House was given to the Secret Service. Warren G. Harding reopened the White House gates to the public after World War I, but they were closed for good during World War II because officials feared an attack. "Previously, casual visitors had been allowed to stroll around the White House grounds during the day," Doris Kearns Goodwin wrote in "No Ordinary Time: Franklin and Eleanor Roosevelt: The Home Front in World War II." "But now sentry boxes, staffed with Secret Service and White House guards, were set up at all the external gates. Only those with official appointments were allowed inside, and only after careful scrutiny," she wrote. That was the precursor to what happens at the White House today, when visitors must approached a guard booth and show identification. If they are on an approved list they will be let in and must go through security. After the attacks at Pearl Harbor, the Secret Service proposed covering White House skylights with sand and tin, she wrote, an idea that Franklin Roosevelt rejected. The 1983 bombing of the U.S. Embassy and Marine barracks in Beirut caused officials to erect concrete jersey barriers outside the White House perimeter. After the 1995 Oklahoma City bombing, the streets surrounding the White House were closed down to vehicle traffic. The breadth and depth of what the Secret Service and White House Police Force, which became part of the Secret Service, patrols has also grown over the years. According to the 1995 report, it grew from a White House police force of 80 officers in 1942 to 1,200 members by 1995. It now protects all presidential and vice presidential office buildings. Through it all, there have been White House tours. But those were restricted after the Sept. 11, 2001 attacks. People interested in going on a tour must now submit their names through their member of Congress or the embassy of the country where they are a resident and then go through a security check. "Notwithstanding the trend toward restricting public access to the grounds, the Executive Mansion remains one of among the world's only chief executive residences to operate as an open museum," said the 1995 report. Of course, it all depends how you define "open." According to a Post assessment, at least 32 incidents similar to the one that occurred Friday have happened since the mid-1970s. And the area around the White House is often closed amid reports of someone throwing a bag over the fence or, as was the case a few months ago, a naked man running up to the White House gate. "Providing security at the White House is a complicated business," Earnest said.